Founded in the 1530s, Vila Velha features a modern skyline of tall buildings pressed against the curved coastline of the Atlantic Ocean. 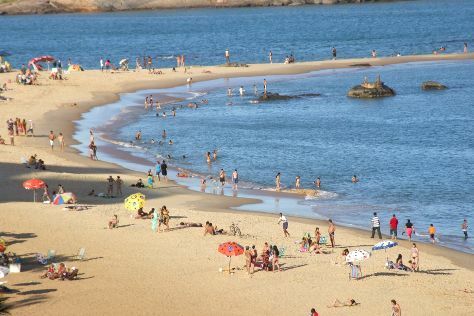 You'll visit kid-friendly attractions like Costa Beach and Curva da Jurema. Explore Vila Velha's surroundings by going to Mosteiro Zen Morro da Vargem (in Vitoria) and Santa Cruz (Putiry Beach & Mar Azul Beach). The adventure continues: enjoy the sand and surf at Canto Beach, tour the pleasant surroundings at Parque Botanico Vale, take some stellar pictures from Morro do Moreno, and pause for some serene contemplation at Nossa Senhora da Penha Convent. To find reviews, other places to visit, and other tourist information, refer to the Vila Velha trip itinerary site . In July, daytime highs in Vila Velha are 31°C, while nighttime lows are 21°C. Cap off your sightseeing on the 22nd (Mon) early enough to travel back home.